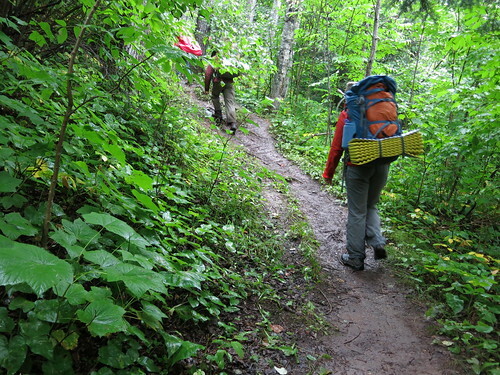 Because I wrecked my back (that will come up frequently, sorry), we figured the only way to get me on the trail again was Lee taking a bigger chunk of the load, and seriously lightening my load. Heaviest thing I typically carry is a tent for the 3 of us. It's a 10 year old Alps Mountaineering, weighing best we can tell around 8 pounds (about 3.5kg). 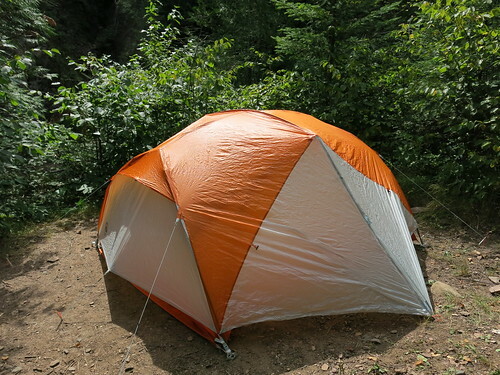 Over the winter I did a lot of research, and we ended up buying a Big Agnes Copper Spur 3 because it's orange. The big quick win, is that we went to about 4 pounds, halving our shelter weight (again, we haven't weighed it). Tent volume decreased by about 1/3. The pole bundle is also significantly shorter, so easier to pack. The fabric is a lot lot lot thinner. So I jam the zippers, something I've never had a problem with before. I had the door held open with the toggle one day, went to bed after dark, and instead of untoggling the door, I ended up sending the toggle through the loop twice more before I gave up and turned on my light. Pole clips have come lightyears in the past 10 years. Boo can clip and unclip these! Three 20" sleeping pads fit inside. I'm 6'1" ( 185cm) tall, and I fit with my head and toes not touching the ends. If Boo slept parallel to us, we'd all fit OK. I've only ever used shepherds crook stakes, so the tiny angle iron stakes were new, and need a little finesse to keep the lines from slipping off. I did put a loop of bright orange cord on them, which kept them from getting lost and provides a little pull handle. 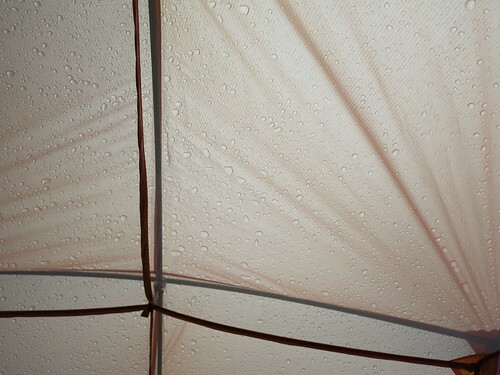 The first "dry" run, in an RV campground, the tent survived pea-sized hail with no damage or leaks. Second use, there was a more sustained rain. There was a stream under the tent (with footprint), but no water came in that way. The fly sagged in the rain. We did not leave enough cord to tighten it up, though, so the fly hit the tent body in the night, and I got dripped on. The "rainbow" doors that open down have not been a problem when it's dry. Packing up in the mud, I got mud inside the tent, because the doors were flopping all over. Practice needed. Orange on the outside of Lee's pack is the entire tent. All between the sleeping pad and top lid. It's small. What's your current tent? What do you like about it? What would you want different?